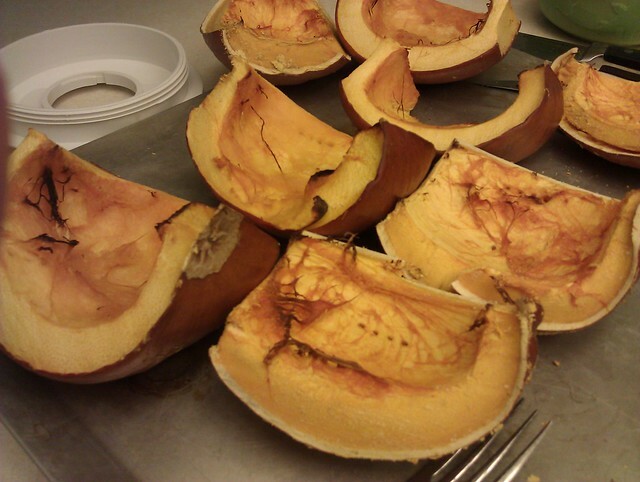 Today I've spent some time in the kitchen. 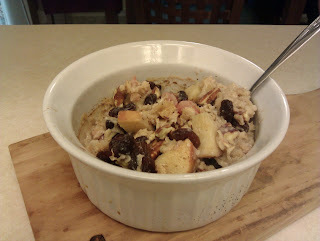 First I started by baking a batch of apple-strawberry oatmeal. Super tasty. Below is a modified version of a few recipes I found online. mix oats, milk, fruit and cinnamon in a bowl together. place in pre-heated oven. Bake for 40 minutes. 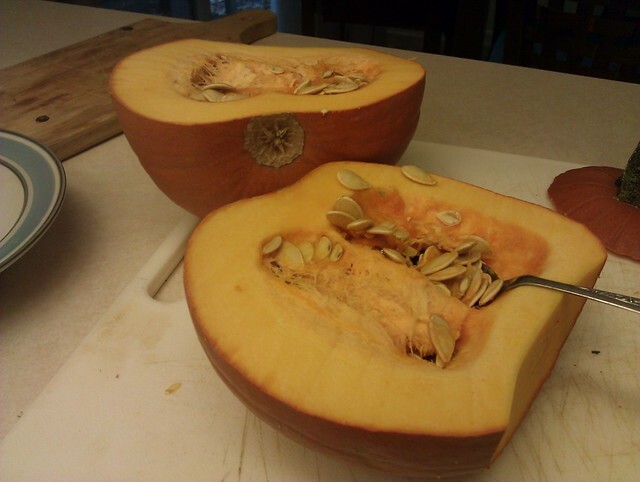 the pile on the left is from the normal pumpkin I could slice with a knife. 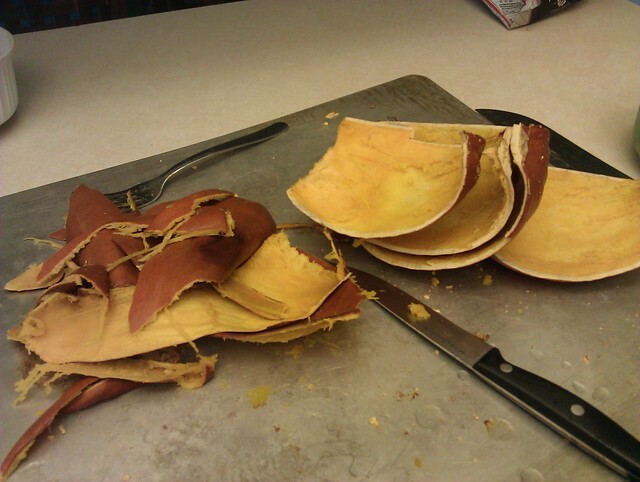 I could easily peel the skin away from the pumpkin, similar to how you peel a banana. 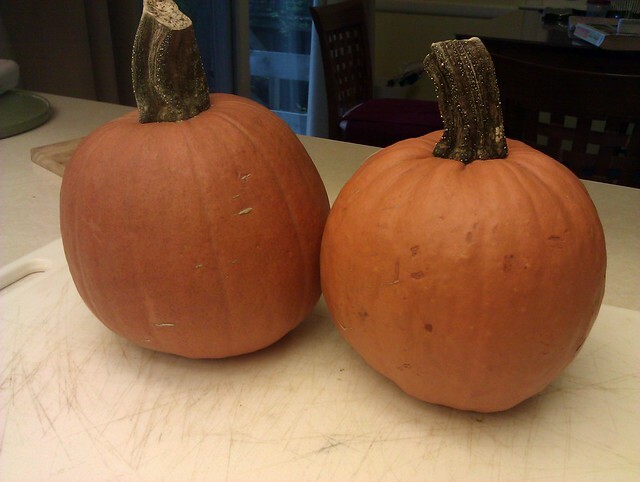 On the right are the hard shells from the hacksaw pumpkin.I could not peel those pieces and used a knife to cut the pumpkin free. 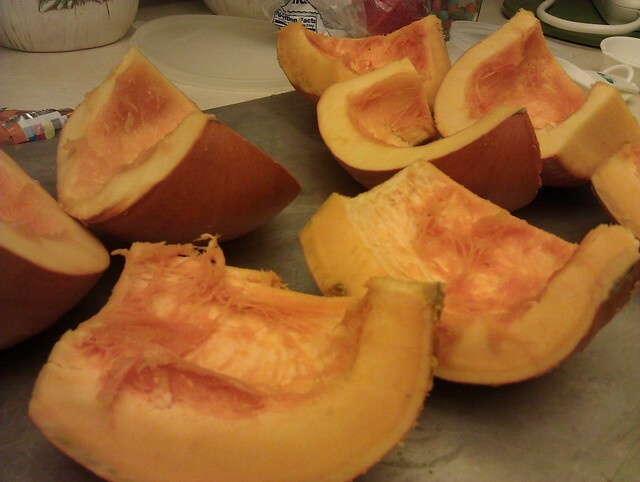 While the oatmeal was baking I started working on the next project - pumpkin puree. 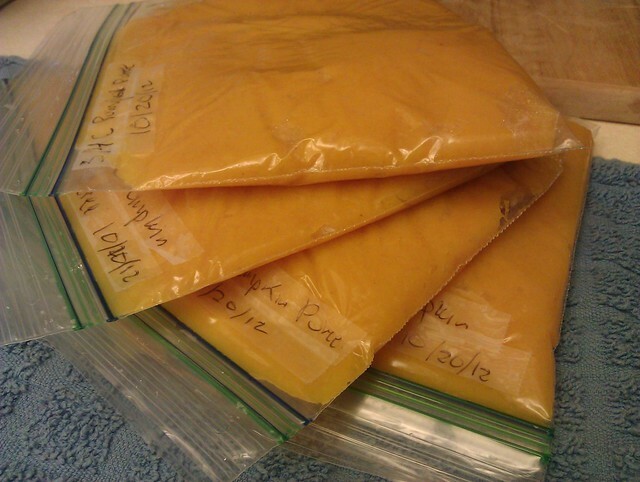 I used the Pioneer Woman's directions for making puree. I don't have a food processor, so there was some moving back and forth between the stand mixer and a blender. 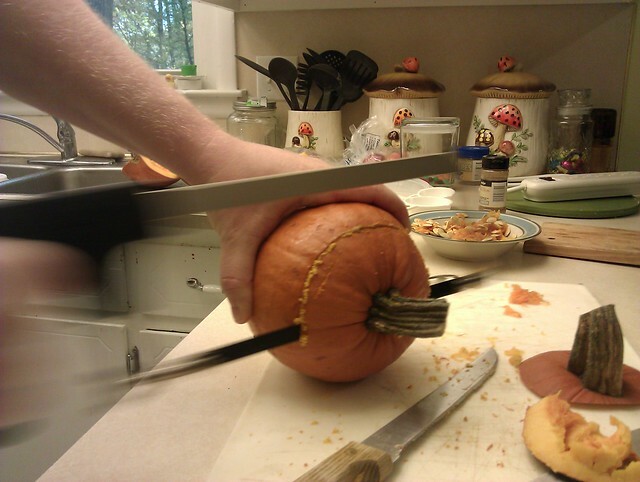 Kind of a pain. In the evening I decided to try my hand at making cannoli. I've never actually had a cannolo, so I have no idea if they're tasty or not. But I generally like most Italian (or Americanized versions of) dishes, so I figured it was a safe bet. Plus I've had this old box of cannoli tubes of my grandmother's for ages. I don't think she ever used them. I used the recipe on the back of the box, although the recipes I found online were all basically the same and involved using a wine of some sort. If I know Chris might eat something I'm making, I use a substitute like fruit juice. In this case the recommended substitute seemed to be pomegranate juice. A lot of the recipes I read alternated between pan frying in a deep frying pan (which I dont really have) or deep frying. I opted for deep frying. Aside from filling the entire house with smoke and making my eyes sting, the deep frying went alright. Although next time I may try pan frying and see if that makes a difference. I ended up frying about half the shells and froze the rest of the dough for later. The single cannolo I ate tasted fine, although the shell was a little tough. 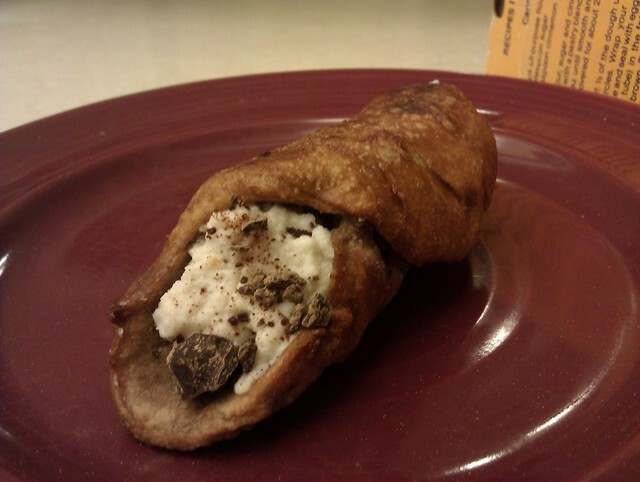 Of course, like I said before I've never actually had a cannolo, so I have no idea if it tastes right or not. 1313/365 - We Have Mail. Lots and lots of mail!